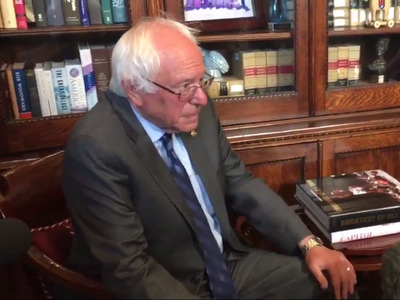 Bernie Sanders had a painfully awkward reaction to being asked about President Barack Obama’s endorsement of Hillary Clinton moments after news of it broke online. “Senator Sanders, what is your reaction to the president endorsing Hillary Clinton today?” a reporter asked Sanders, who was sitting across from Senate Minority Leader Harry Reid. Reid attempted to thwart additional questions, but reporters asked again of what Sanders’ thoughts were.